Choosing the correct coffee table can be a difficult task. With such a huge variety of coffee tables to choose from, you can quite often find it hard to make the right decision. There's a lot that needs to be figured out: the amount of room you have available to position the table, whether you want a glass, wood or metal table and even the design you'd like the table to take. With this Coffee Table Buying Guide, we hope to put some of those pondering queries to rest and assist you on your way to finding the ultimate table for your home. If you're unaware what 'exactly' a coffee table is, a coffee table is the table that sits infront of your sofa and your living room chairs in your living room. It's normally seen as the focal point of your living room furniture and can be used to place your coffee cup upon, decorations, that plate of biscuits and much more. How do I choose a coffee table? 1. Is it for show? In this case, the style is most important, choose something stylish, modern or traditional that matches your existing living room furniture. 2. Do you intend to use it for placing food, snacks and drinks on? In this case ensure it is in within easy reach of sofas and chairs. 3. Is it for storage? Make sure the drawers shelves provided have ample room for remote controls, magazines and any other bits and bobs. Space: How much space is there in your living room for a coffee table? Remember that most coffee tables require ample space in the immediate areas surrounding the coffee table, especially if placed in front of sofas and living room chairs for people to sit comfortably round it. Make sure when measuring the space you require for the coffee table you take this and the coffee tables shape into consideration. Type: Types of coffee tables include glass coffee tables, wooden coffee tables, marble coffee tables and more. Pick a design which best matches the decor of your interior furniture. With many different contemporary and traditional styles to choose from you won't find it hard to find plenty of choices. It is very important to make sure you match it up with your existing living room furniture so it doesn't look out of place. Traditional styles often include wooden styles whilst contemporary coffee tables are usually sleek and simple made from glass etc. 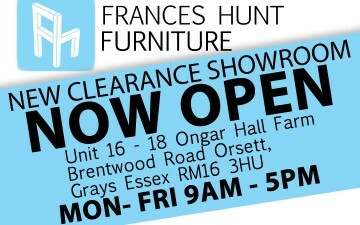 View Frances Hunt coffee tables.